rec. 2014-2016, Muziekcentrum Enschede, the Netherlands. 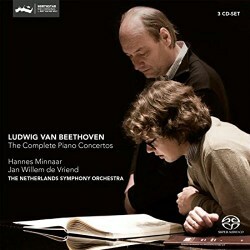 Pianist Hannes Minnaar has made a name for himself as a soloist with three albums to his name, member of the award-winning Van Baerle Trio, and most recently winner of the Dutch Music Award in 2016, the highest available from the Dutch Government. This means being in a safe pair of hands when it comes to the solo parts for Beethoven’s five Piano Concertos. These recordings have already appeared as individual CDs aside from the Third Concerto which, being too short in duration for a physical release, has been download-only until now. There is an interesting aspect of this recording hidden at the back of the booklet. Along with the selection of a Steinway & Sons concert grand by the soloist there is mention of the efforts made by tuner Gerben Bisschop to “prepare the historical tuning of the instrument.” This is not further clarified, but presumably implies a move from equal temperament to a more old-fashioned meantone tuning. You probably wouldn’t notice much difference here in comparison to alternative modern-piano recordings, though it I had to make a call on the character of the piano in relationship to the orchestra then it seems just a little warmer in tone. The trend for piano sound in recent years has been for sparkly brilliance, and this extra touch with regard to the preparation of the piano lends an extra waft of expressive nuance to the whole. That exposed first chord at the beginning of the Fourth Concerto is certainly interestingly textured. Comparing Minnaar and de Vriend with Paul Lewis with Jirí Belohlávek and the BBC Symphony Orchestra on Harmonia Mundi (review) we find similar timings but a generally bigger-boned sound. Lewis is more stormy as a pianist when all hell is breaking loose, and Belohlávek’s strings colour their sound with a sheen of vibrato which changes the ‘presence’ of the orchestra if not necessarily its dynamic contrast. The Orchestra of Opera North has Howard Shelley as both pianist and conductor in the Chandos set of the complete works for piano and orchestra (review) in the big acoustic of Leeds Town Hall has if anything a more ‘romantic’ touch when it comes to vibrato, but with satisfying sonics and with generally brisker tempi in the outer movements this is a collection that avoids being stodgy and is one I still admire greatly. Nicolaus Harnoncourt is a conductor with links to historical performance practice, and his recording with Pierre-Laurent Aimard on Warner Classics (review) has an almost operatic sense of drama in its dynamic inflections and teasing way with tempi and Beethoven’s little expressive corners. While this is a fine set I’m not sure I prefer it to Jan Willem de Vriend’s less interventionist but still potently engaged orchestra. The more I compare and contrast the more I feel I should stop messing around and just take this set on its own terms. I still have a great affection for Murray Perahia and Bernard Haitink with the Concertgebouw Orchestra on Sony Classical, admire the wilful but never dull Mikhail Pletnev with the Russian National Orchestra on Deutsche Grammphone (review), and would certainly cross the road for a copy of Alfred Brendel’s set with Sir Simon Rattle and the Vienna Philharmonic on Philips/Decca. Each time I’ve gone out and come back to Minnaar and de Vriend I’ve been struck by the integrity of their performances and the synergy between soloist and conductor/orchestra. Sound quality is excellent, with solo spots from the orchestra and the timpani leaping out at you, particularly in SACD surround mode – sample the orchestra sound just before the entrance of the piano in the Third Concerto for a good example of this. Perhaps I am seeking something which isn’t there in the first place, but this isn’t particularly the set I would turn to for the maximum in elevated spiritual revelations. The central Adagio un poco mosso of the Fifth Concerto has been known to make tears be shed but I don’t feel that here, good as it is. There could be just a little more pressure on the strings to support the big piano sound, the winds could be just that little bit more graceful with the held notes… There’s never anything wrong, but nor am I moved. Compare also the breathless hush created in your mind when encountering Murray Perahia’s opening to the Largo in the Third Concerto with where you are taken by the more matter-of-fact Minnaar – excellent of course, particularly in the handling of those spread chords, but where’s that tension of expectancy? Fast movements are well-paced, filled with energy and rousing without being particularly adventurous or revolutionary. From the outset the word ‘solid’ popped into my mind, and it has stayed there ever since. Turn up the volume and there is plenty of meat on these bones however, and I can guarantee that no-one will be disappointed with this set as a product. What am I saying? Basically, this is a truly superb set of Beethoven’s five Piano Concertos and worthy of anyone’s attention. Will I want to hear it again? Yes indeed, which in its way is recommendation enough. If my jaw didn’t hit the floor at any single moment in particular then maybe it will next time when the planets are better aligned.